Swansea Comic Con – There and Back Again! Swansea Comic Con was a great success! We shared the table with our friend Cyrstallized Zombie, a very talented illustrator and artist. This Con was also saw the release of Age of Savagery an anthology Josh wrote a 10 page comic for, published by DeadStar Publishing. Its an 80 page anthology featuring the works of 20 different authors and artists! We have also updated the website to feature a store showcasing what was available at Swansea Comic Con and is still available now to purchase! Feel free and get in touch! 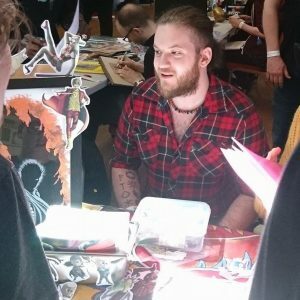 Josh will be at Cardiff Comic Con this Saturday 12th to sign issues with some of the other creators. The next Con we will have a store at will (hopefully) be Cardiff Indie Expo June 2nd so keep an eye out for more updates! !